The coughing began just after midnight as a far-away noise in the back of my sleeping mind. As I rose to consciousness, I half-thought it was The Princess. Was it The Princess? She hadn’t seemed sick during the day, in fact, all of them seemed to be getting over brief bouts of runny noses, and I had just been thinking that they were all on the mend. If I just lie here, I thought, it will stop and I can drift back to where I was. The coughing persisted, and then came footsteps down the hall. I groggily thought The Princess was coming to climb into our bed as she has been wont to do (too often) in the past. I prepared to feel her pulling on the footboard and crawling her way up the mattress to settle in between Manfrengensen’s body and mine, her cold feet taking time to warm against my calf under the quilt. The footsteps stopped on my side of the bed, and opening the eye that was farthest from my pillow, I saw that the visitor was Clooney, not The Princess at all. He was hunched over in his striped pj’s, looking quite miserable as he mumbled something that seemed incoherent to me. Still in a groggy state, I assumed he’d had a nightmare, and made a motion for him to climb into bed (the sliver that The Princess would have carved for herself), but then he repeated his words. “I just threw up,” he said. Now, he’s not much of a hurler; hasn’t proven himself susceptible to stomach viruses in the past. In fact, I wouldn’t even consider him a placer in this sport that Edison has so often gone for the gold medal in. So when Clooney said, that he’d thrown up, I assumed something trivial, something he’d thought was vomit that was really nothing. “Okay,” I said, calmly, beginning to swing my legs over to get out of bed. 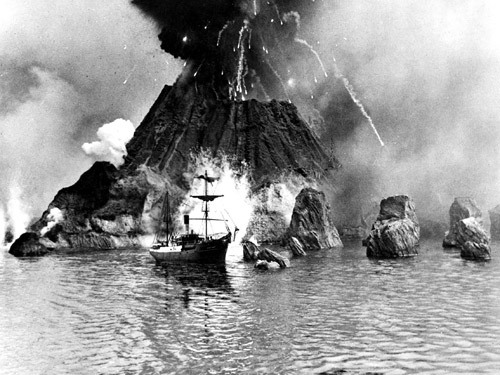 And then he erupted…like Krakatoa. I started freaking out, jumping up, and gingerly stepping tipped-toed between what had landed like spin-art on the floor, “Clooney, get to the toilet!” I said, trying not to shout, but the urgency evident in my voice. And then, I had to run after him, repeating “the toilet! Clooney!” as he ran down the hall to the one closer to his bedroom rather than just shortcutting to the master bath on other side of my bed. By this time, Manfrengensen was chasing after me, chasing after him, and the horror, my god, the horror. Parenting: every day another surprise.